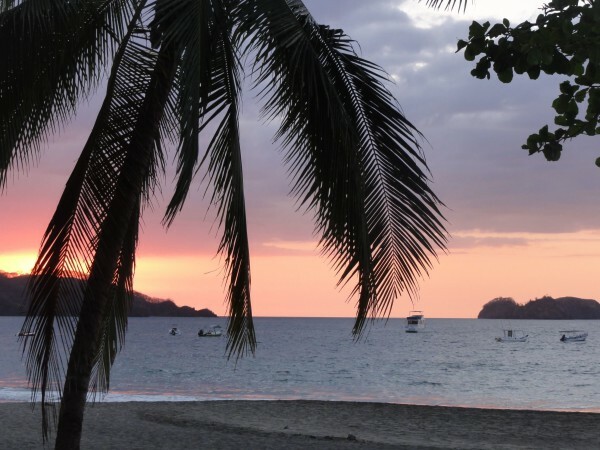 Are you looking for ways to save money and get the most out of your Costa Rica vacation? Well we have a deal for you! It’s a free article on some of the best tips I have after traveling Costa Rica for the last decade. Enjoy and of course, please leave comments at the bottom for any advice you can share with your fellow travelers. Transfer from the airport to your first destination so you can wake up to scenes like this on the first day of your vacation in Costa Rica. Rather than staying at an airport hotel in Liberia, you can drive 25 minutes to Playa Hermosa and catch a sunset before eating at a beach front restaurant. Sure beats an airport hotel! If you are using Liberia Airport (LIR) and want to stay close to the airport, head over to Playa Hermosa, Playas del Coco, or Playa Panama. Each of these beaches is located within 25 minutes of the airport. Who doesn’t want to catch a beautiful Pacific sunset or wake to the sound of waves rolling in over the sound of airplanes flying by? Follow this link for more ideas to enhance your experience at Liberia Airport. 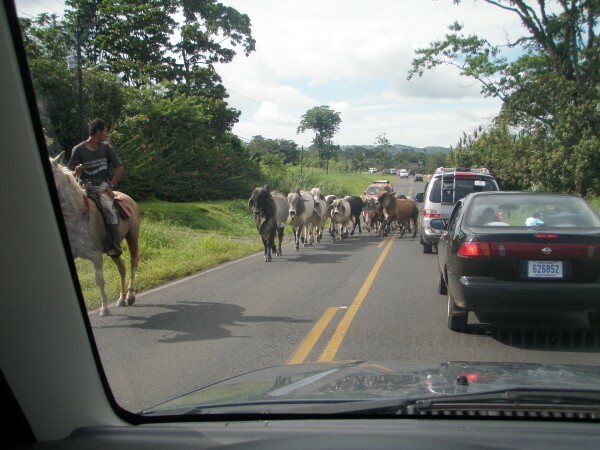 Driving in Costa Rica can be quite an adventure! We have an entire page covering the pros and cons of renting a car in Costa Rica, so I won’t elaborate on this topic too much. The bottom line is by the end of your trip, you’ll nearly always spend more money on a rental car than a combination of private and shared transfers. Aside from saving money, security, and comfort, you’ll save yourself the headaches of trying to navigate in a foreign country with poor road conditions and few signs or streetlights. Plan a stop between destinations to break up your trip and take in sites like this! A long drive doesn’t have to mean a boring drive! 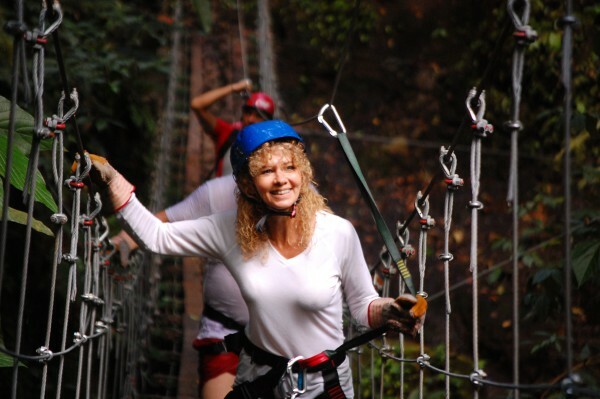 There are hidden treasures and fun things to discover all across Costa Rica. Most good transportation companies will allow you to stop along the designated route if you ask in advance and the driver can keep an eye on your luggage. The Rio Tarcoles Bridge is a great stop to see giant crocodiles from the safety of the bridge. It’s located on Rt.34, approximately 25 km north of Jaco. Finca Mia is a good stop for a bite to eat and to see scarlet macaws. It’s located on Rt. 1 in Limonal, across the street from the Rt. 18 turnoff to the La Amistad Bridge and Nicoya Peninsula. There’s another good spot for spotting scarlet macaws between Jaco and Playa Hermosa along Rt. 34 on the Central Pacific. Between the towns, you’ll drive along the coast on a large rock outcropping. Turn off at the pull off area and listen for squawking or check the almond trees. Random waterfalls – There are hundreds of waterfalls across the entire country. Keep an eye out along Rt.34 as you drive south of Dominical. There are many along Rt. 2 in the mountains between Cartago and San Isidro El General. There is a pretty big one in the mountains between San Ramon and Bajo Rodriguez on the way to La Fortuna (Arenal). Of course these are only a few examples. You’ll find waterfalls just about anywhere there’s a mountain. The drive along Lake Arenal is gorgeous. There are plenty of small restaurants and art galleries along the way. *If you have a rental car, you can stop anywhere you want, but keep in mind that you shouldn’t wander far from your car if you have anything of value in it. You’ll be glad you skipped the all inclusive when you’re able to explore the beauty and unparalleled diversity of Costa Rica. 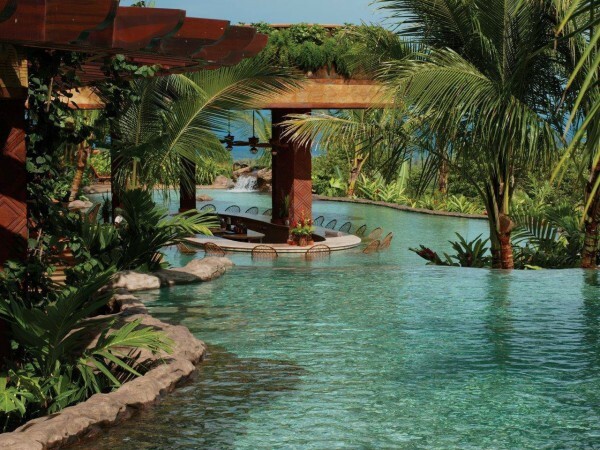 If you have any interest in experiencing Costa Rica, bypass the all inclusives. You’ll save money and have a much more rewarding experience by staying at hotels and resorts with local flavor. All inclusive resorts are popular in many Latin American countries due to safety concerns, but this is not a problem in Costa Rica. Costa Rica is safe and the people are friendly. There are plenty of fun things to do (outside of the resorts), more hidden treasures than I could type in a year, many dining options, and you’ll save enough money to pay for a few activities. Bypass the cookie cutter international chain and I promise your annual vacation will turn into the experience of a lifetime! Don’t take my word for it though. Check out this article that breaks down the cost savings between all inclusive and traditional resorts. Costa Rica is so much more than a beach destination. 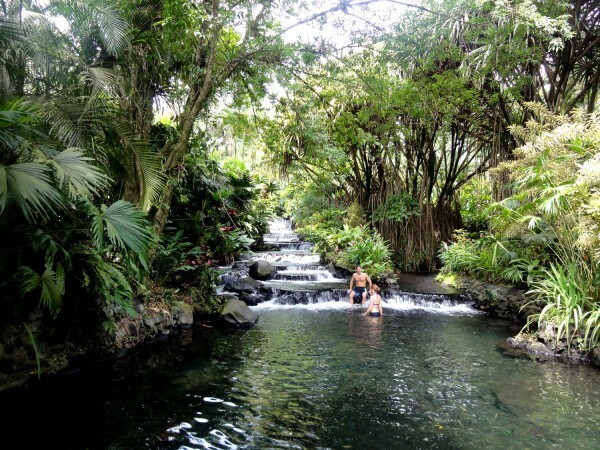 Most of the top attractions such as these hot springs at Arenal Volcano are found inland. 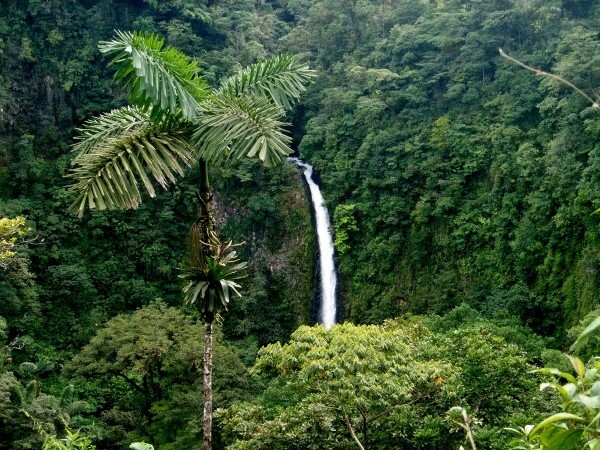 There is little doubt that you have heard plenty of hype about the amazing things you can do in Costa Rica. You went to the beach resort w e b s i t e s and they all show inviting pictures of Arenal Volcano and hot springs, whitewater rafting, waterfalls, rainforest, or amazing photos of the Monteverde Cloud Forest Reserve. They’re showing you these highlights because they’re among the best things to do in Costa Rica. But they’re not telling that you’ll have to drive four hours in each direction to visit them. If you take one piece of advice from this article, this should be it. Spend a few days inland before heading to the beach and you’ll be rewarded with an amazing experience unlike anything you’ve done before. Go to Arenal Volcano for hot springs and an enormous selection of adventure and wildlife observation tours. You’ll find the country’s best tour operators and world class resorts. Head over to the Monteverde Cloud Forest Reserve for outstanding birdwatching and some of the best canopy tours south of the Mississippi. Of course, there are plenty of other inland destinations, but the idea behind this is to open your mind to the truly amazing experiences Costa Rica’s inland destinations have to offer. Save time and money on day trips by asking the right questions BEFORE you reserve! There are a lot of really cool things to do in Costa Rica, so you’re going to face a wide range of activities to choose from. Choose your destinations wisely based on your interests and then stay close. 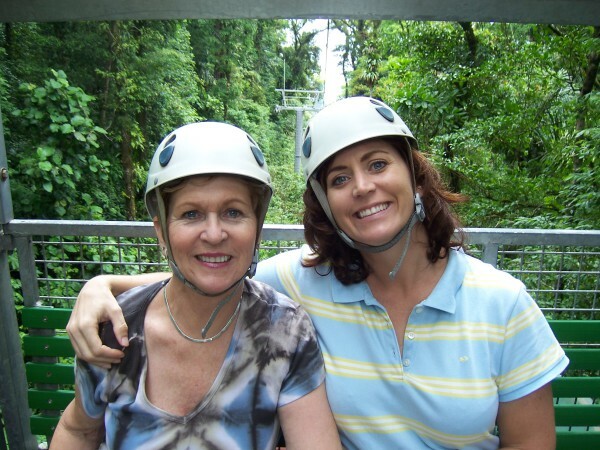 Many tours in Costa Rica require long drives that are not included in the description. Who wants to spend half a day driving to and from a day tour? And keep in mind that someone has to pay for all of that gas! Save time, money and frustration by asking the tour operator questions before you reserve such as “how far is the tour from my hotel?” or “how long will it take to get there?”. 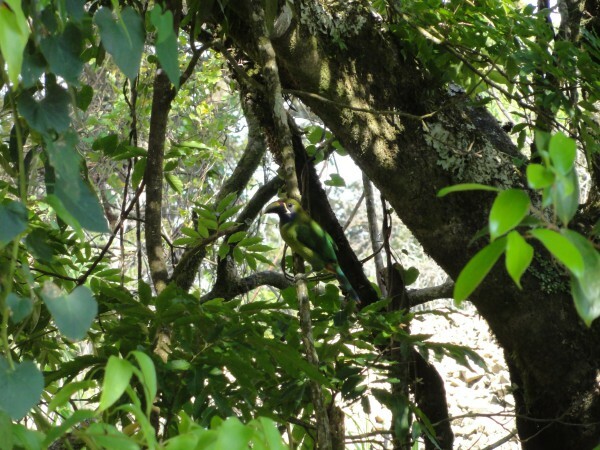 Use local guides for wildlife tours so you can see camouflaged wildlife such as the rare emerald toucanette in the (zoomed in) photo above. As a fiercely independent outdoors man, this was a difficult concept for me to grasp. The idea of going with a guide to point out wildlife really baffled me as I was always the first to spot wildlife back home in the states. I quickly learned after moving to Costa Rica that going with a guide increases your odds of spotting wildlife twenty-fold. These guys grew up here and know the sounds and shapes of the animals as well as what they eat. While wildlife is plentiful in Costa Rica, most animals are surprisingly well camouflaged. A good guide will know to look for congo monkeys or sloths near Balsa trees, they’ll recognize the hollow call of a resplendent quetzal, or will take an extra moment to look for a dart frog between the roots of a huge ceiba tree. Stay at a hot springs resort to save money and unwind after each day’s adventures! A day pass to the hot springs is expensive! There are many hotels with hot springs in the Arenal Volcano area. Save time and money by staying where they’re free. Step just a little out of your comfort zone and you will have your own photos like these! Memories are only possible if you create them… Step out of your comfort zone and you’ll be rewarded with an amazing experience. I’m not suggesting that you jump out of a plane or take up hand feeding crocodiles, but I am suggesting that you open your mind to something new. 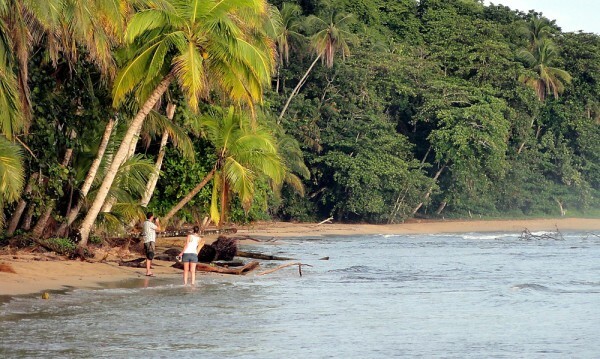 Think of Costa Rica as an all ages playground. There’s something fun or interesting for everybody and extraordinary experiences are within your grasp. Step out of your comfort zone, do something, different and enjoy the memories for years to come! Do you have something to add to the list? Please share your ideas in the comments section below.